More Thai and Filipina girl friends here! What is the real girl friend experience like in Asia? Well I am pretty sure it is something like this as these pics were taken by some dude of his real Thai girl friend. 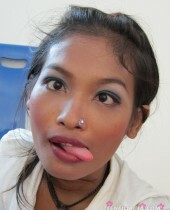 Actually it’s not just some dude it’s the famous Thai erotica photographer Brad and this must be his current squeeze.